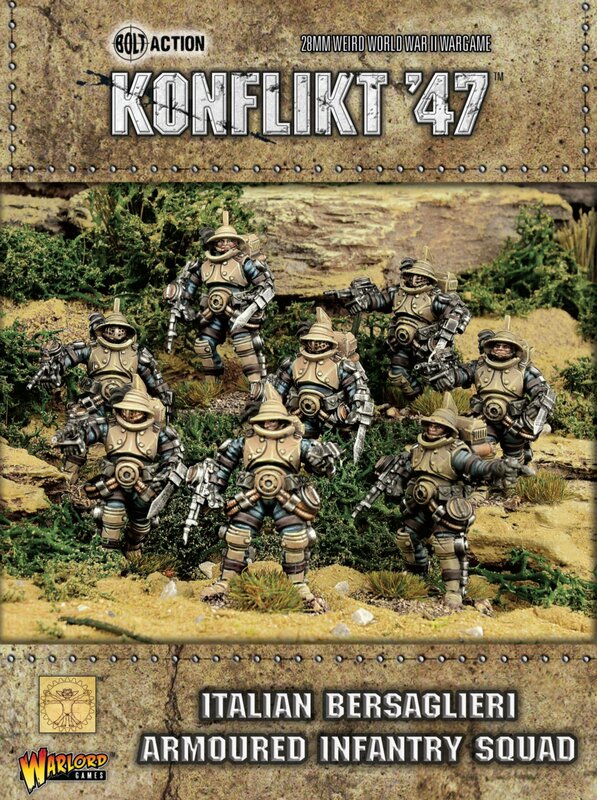 Warlord Games haben zwei neue Sets Italiener für Konflikt ’47 in ihrem Shop. In response to the Allied landings on the Italian soil, in September 1943, Mussolini was arrested and his government overthrown by Royalist forces loyal to King Victor Emmanuel III. Italy immediately sought an armistice with the Allies which was agreed in that same month. This led to a short period of confusion within the Italian armed forces with differing elements receiving contradictory briefings and orders that led to the Army in particular splintering into several factions. 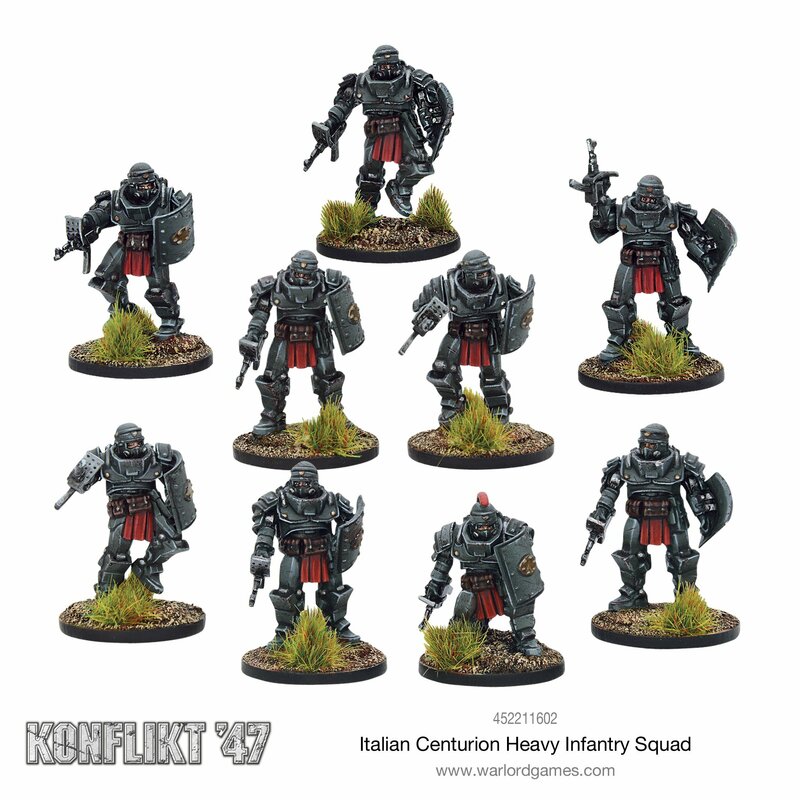 With the country now divided and recognising their deficiencies in heavy armoured vehicles, the RSI and Kingdom of Italy have chosen divergent paths for the reconstruction of their armies. 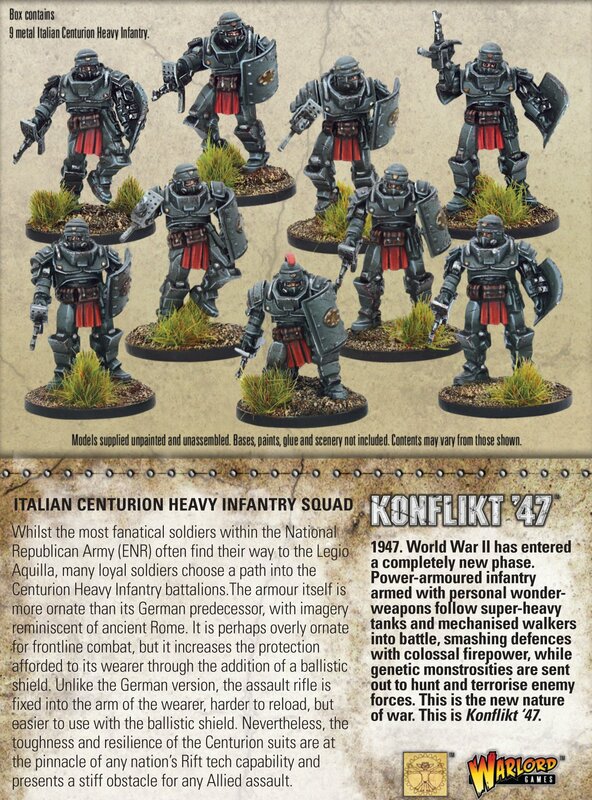 In the north, the fascist National Republican Army (Esercito Nazionale Repubblicano or ENR) have concentrated their mechanised forces into flying reinforcement columns, being designed to block any Allied breach in the defensive Gustav line. In the south, the Co-belligerent Italian Army (Esercito Cobelligerante Italiano or ECI) is forming more conventional armoured forces, utilising the Allied willingness to provided US and British tanks and walkers. 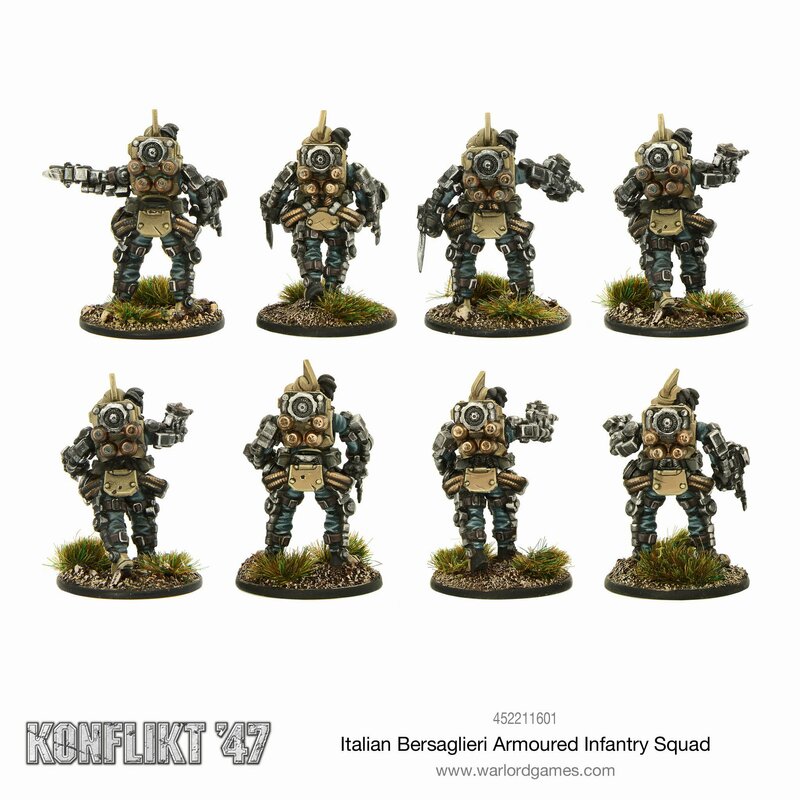 On both sides of the imposing Gustav Line, the more elite Italian formations are built around newly acquired Rift-tech equipment such as heavy armour and jump infantry. 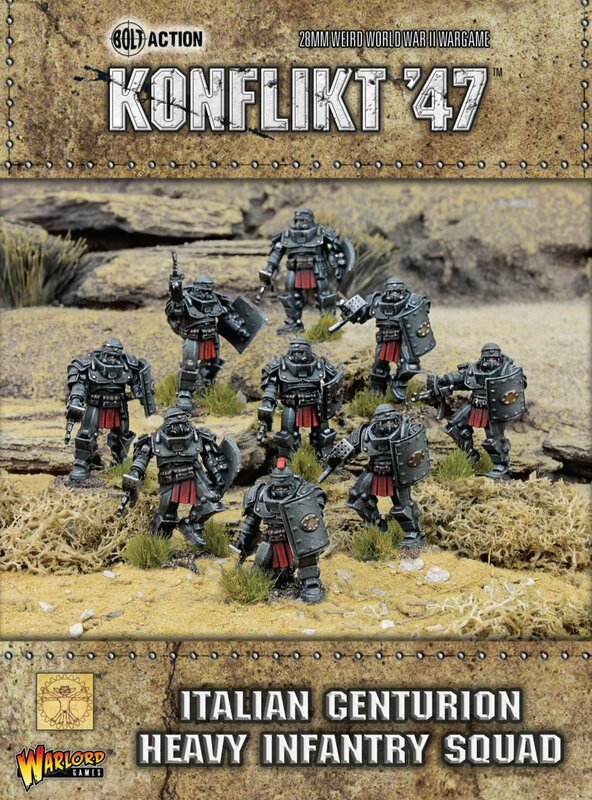 Whilst the most fanatical soldiers within the National Republican Army (ENR) often find their way to the Legio Aquilla, many loyal soldiers choose a path into the Centurion Heavy Infantry battalions. The armour itself is more ornate than its German predecessor, with imagery reminiscent of ancient Rome. It is perhaps overly ornate for frontline combat, but it increases the protection afforded to its wearer through the addition of a ballistic shield. Unlike the German version, the assault rifle is fixed into the arm of the wearer, harder to reload, but easier to use with the ballistic shield. Nevertheless, the toughness and resilience of the Centurion suits are at the pinnacle of any nation’s Rift tech capability and presents a stiff obstacle for any Allied assault. 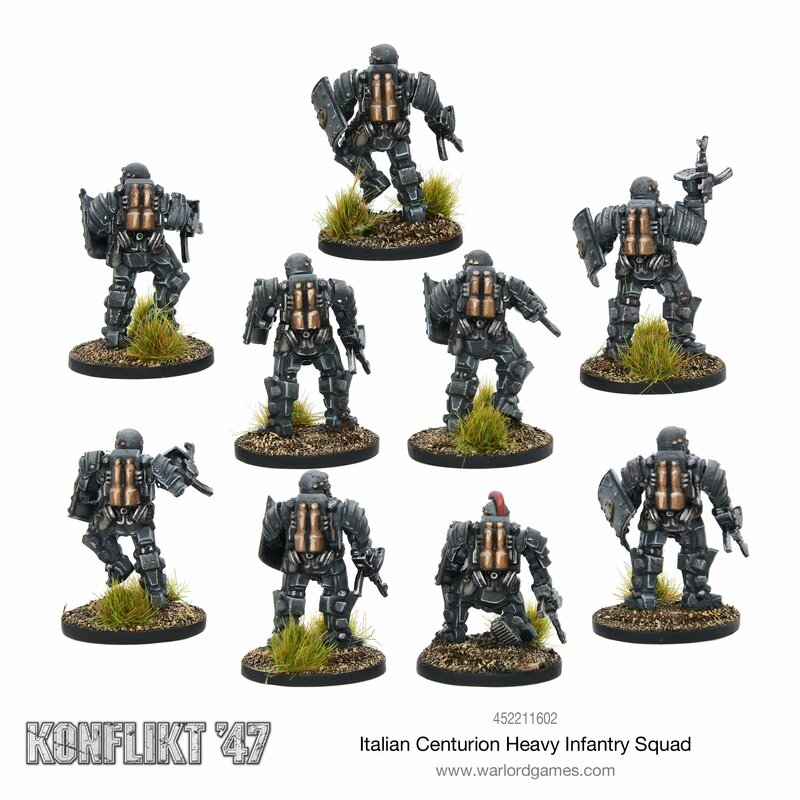 With a largely infantry based force, the use of Rift-tech designed heavy armour is a logical development for the ECI. 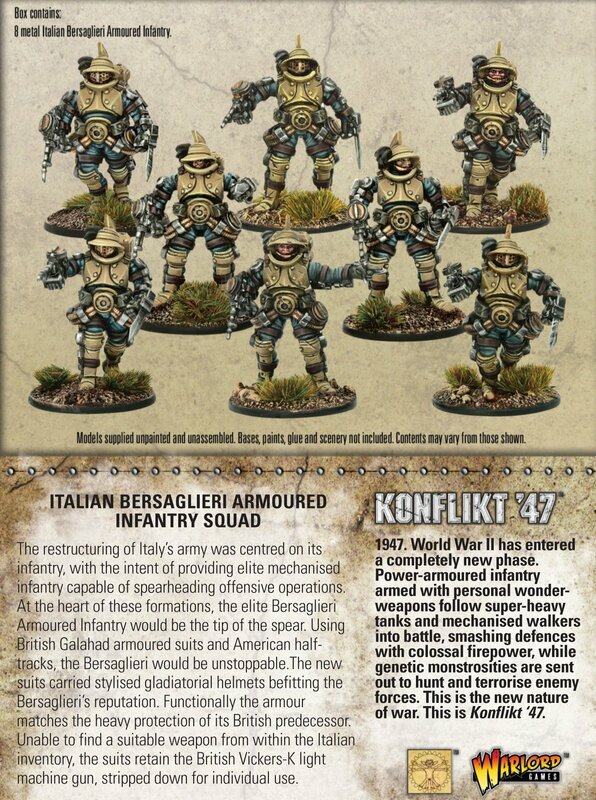 Selecting the British Galahad suits as a base, they have been adapted to carry stylised gladiatorial helmets befitting the Bersaglieri’s reputation. 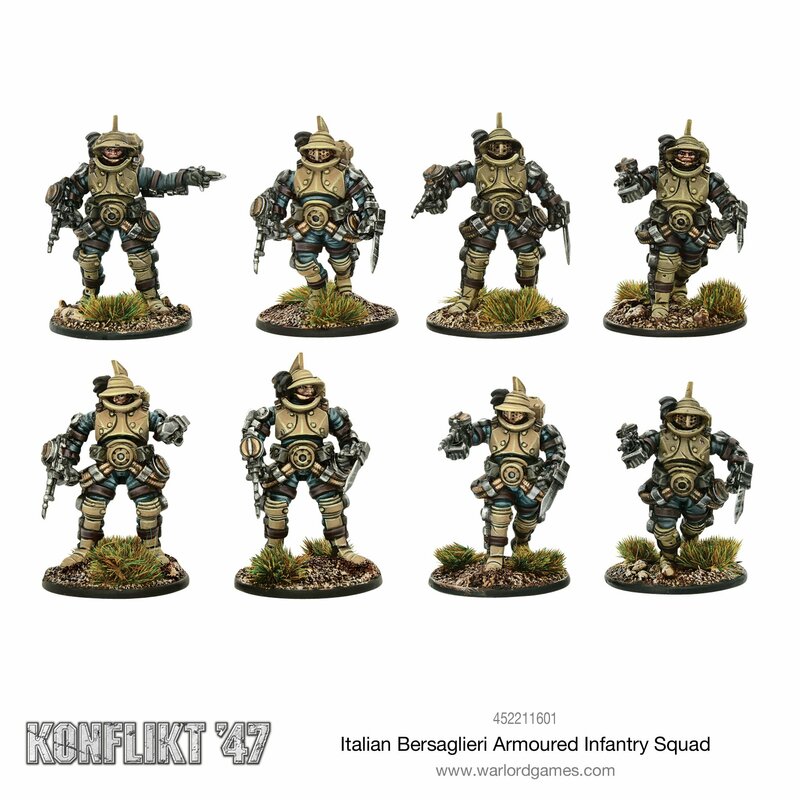 The Italians now look to their elite Bersaglieri units to provide armoured spearhead troops for their mechanised and close assault operations. Ich finde die großartig. Man sieht bei beiden genau wo sie her kommen. Die Centurions sind eine modifizierte Variante der Wehrmacht HI und bei den Bersaglieri kann man ohne weiteres die Galahads der Briten erkennen. Da ist dann auch die sehr unterschiedliche Bewaffnung interessant.